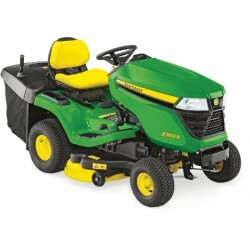 Part of the Lawn and Garden range from John Deere is here, take a look at the X166R below. The X166R combines dependability, durability and power in every aspect of its construction, including a fully welded steel frame and a cast-iron front axle. It is an automatic rear collection machine providing a perfect finish.